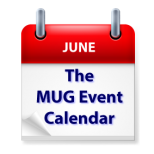 Apple’s Worldwide Developers Conference continues to dominate MUG Meetings, this week in groups in California, Arizona and Ohio. Joe Kissell will talk to a Northern Virginia group about iCloud, and Bob “Dr. Mac” LeVitus will provide his own take on WWDC, along with his latest project, at a California group, while Apple TV is on the agenda at yet another California group.